We are born to move. Watch any new infant delight with the discovery of her limbs, toes, and fingers. We arrive with a sensory curiosity and a desire that allows us to discover, explore, and master the complex movements of reaching, rolling, sitting, crawling, standing, and walking. Gradually, we learn how to put our intentions into action. 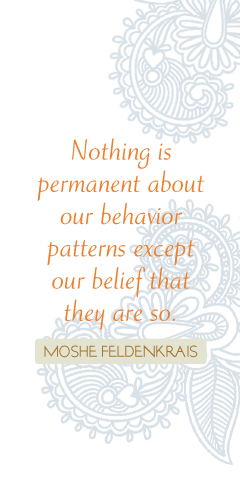 Moshe Feldenkrais capitalized on this process when he developed The Feldenkrais Method®. He recognized that children naturally have a sense of grace and ease that is energetic, spontaneous, expressive, and seemingly effortless. Over time, we can lose this spontaneity, settling into habitual patterns of self-use—from repetitive work, societal expectations, or compensation from injuries, lifestyle, or trauma. Eventually we become limited in our movement abilities. The nervous system is so capable of adaption we may not even realize what we have lost. If we experience pain, fatigue, injury, and loss of a sense of joy, we chalk it up to aging. It does not have to be this way. Combining the latest research on brain development, neuroscience, learning, and human movement, The Feldenkrais Method offers two pathways to help you reclaim your natural abilities to move freely, confidently, and without pain. In highly personalized Functional Integration® (FI) lessons, we explore patterns of movement that clarify differences between ease and effort, harmony and hard work. We may work on a table, in a chair, or on the floor. Through gentle, non-invasive touch and verbal guidance, I help you sense distinctions, develop greater body awareness, and discover how you can make useful changes. Private session can feel both relaxing and eye-opening. Awareness Through Movement® (ATM) lessons are playful and experimental group classes that explore variations in movement. These mindful, sensory-based lessons develop capacity for attention, and show you the difference between using balanced effort and over-exerting yourself unnecessarily. Simple explorations evolve into more complex ones, as we gradually build an "alphabet of movement" that feels lighter and easier. ATM lessons provide you with a unique tool for relieving pain, improving your performance, even shifting your mindset. There are literally thousands of lessons (available in written or recorded form) addressing many aspects of human functioning. Both of these pathways emphasize curiosity, attention, and a desire for ease. Through playing with variations, reversibility, and close observation of changes, you learn to replace ways of moving that may create tension and pain with ones that feel lighter and easier. Range of motion increases as a result of improved coordination rather than forcing. A natural capacity for joy and spontaneity emerges. In both FI and ATM, people report feeling taller, lighter, better balanced, having a sense of ease, or feeling "more comfortable in their own skin." Ease and freedom are restored to simple, everyday activities. Injuries heal more quickly. ATM and FI lessons are complementary, and can be explored together or separately. Whichever path you choose, you develop your own revolutionary ability for growth, healing, and personal mastery.